National and regional camps are held to train nonviolent leaders and activists. Workshops are conducted frequently to train people to handle conflict creatively and to ensure harmony among communities. 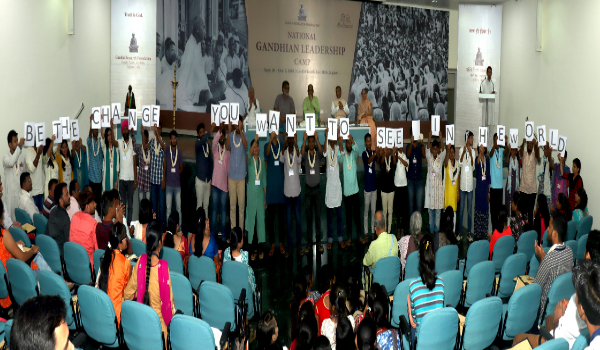 A ten-day youth leadership camp is organized in which the participants are trained to understand their global perspective, to articulate and effectively communicate their ideas with conceptual clarity, as well as to strengthen their commitment and fearlessness. These along with many other leadership qualities can help them become successful change-makers. The GRF organizes lectures by prominent Gandhians, which serve as ideal opportunities for dialogue, debate and interaction. The subjects discussed cover a wide spectrum, including not only established, mainstream Gandhian issues, but also crucial concerns emerging from society at large. The GRF also organizes 4-5 day tours for students and families. In these tours, guests can stay on campus. Here, they have the opportunity to visit the “Khoj Gandhiji ki” museum. In addition, they may participate in interactive sessions on peace & conflict management, join peace walks, take part in yoga & meditation classes, or even watch movies, and visit nearby historic world heritage sites (such as the Ajanta and Ellora caves). They can also get exposure to and learn from visits to the JISL food processing and plastic processing units, as well as gain valuable insights from agriculture related research and demonstration farms.